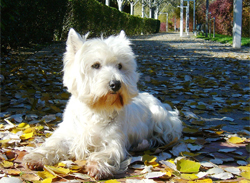 Shop for medicated pet shampoos at VetDepot.com. Although the name suggests otherwise, ringworm (dermatophytosis) is not caused by a worm; it is a fungal infection that affects skin, hair, and nails. Dogs and cats are both susceptible--especially the young, old, and immunocompromised--and so are humans. People can contract ringworm from pets and vice versa. The condition is spread via contact with an affected area on the body or another contaminated surface. "If you observe any of the clinical signs of ringworm, schedule an appointment with your veterinarian." Ringworm takes its name from the circular design of its symptoms. A round pattern of baldness appears, and the skin in the center is typically scaly, crusting, or reddish and is surrounded by a red ring of skin lesions. Affected nails become dry, brittle, cracked, and sometimes deformed. The fungus itself does not cause itching, but bacteria or crust on the affected area may. If you observe any of these clinical signs, schedule an appointment with your veterinarian. Demodectic mange, some insect bites, and other skin conditions are other possible diagnoses. In fact, ringworm is reputed for mimicking the appearance of other skin disorders. Also, on some animals, ringworm may present with a slightly different appearance than described. For these reasons, only your veterinarian should diagnose your pet. And because the condition spreads readily and is highly contagious, prompt attention is needed. Your veterinarian screens for ringworm with an ultraviolet light. The fungus may glow with a green hue during this test, but false positives and negatives are both common. A microscopic examination and a fugal culture obtained from a skin biopsy are the definitive tests for diagnosing ringworm. An antifungal agent effective against ringworm is the primary course of treatment for this fungal infection. Usually, a topical application suffices. Medicated lotions, ointments, or shampoos are often prescribed. PhytoVet CK Antiseptic Flush and Mal-A-Ket Medicated Shampoo are examples. 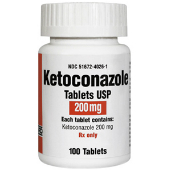 For more serious infections, an oral antifungal agent, such as Ketoconazole, may be necessary. Follow your veterinarian's instructions and label directions carefully, and be sure to implement preventive measures to keep the infection from spreading to other animals and people in the house. Until the condition is successfully treated, take appropriate measures to prevent the spread of ringworm. Quarantine an affected cat or dog. Keep in mind that contact between animals has likely already occurred, and cross-contamination is a distinct possibility. Keep children away from pets. Thoroughly wash your hands, forearms, and any other body part that comes into contact with your pet right away. Vacuum all floor and furniture surfaces daily to pick up loose hair and skin cells and mop hard floor surfaces with a disinfectant cleanser. Wash bedding and toys with a disinfectant and sterilize or replace all grooming implements. Discard items such as cat trees that cannot be thoroughly cleaned and disinfected. Ask your veterinarian about which treatments are best for individual animals in the household (and consult your doctor if you or another person in the house has become infected).